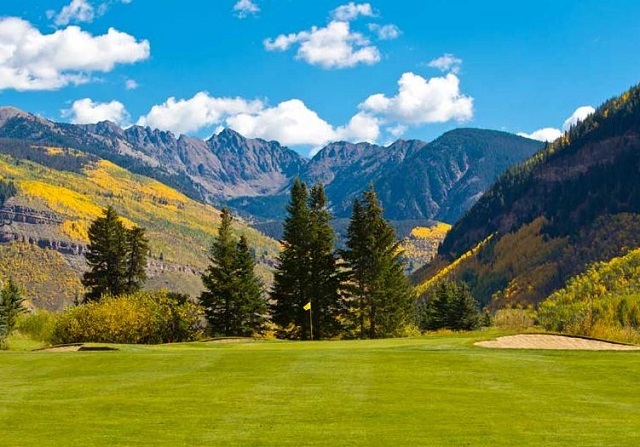 It’s hard to beat a round of golf in the summer in Colorado and one of the best places, bustling with all kinds of other activities, is the Vail Valley, 90 minutes from Denver. Along with three others writers, I got to experience a Rocky Mountain high, playing the private Red Sky Golf Club’s Norman course in nearby Wolcott and the public Vail Golf Club, two distinctively different types of courses. Norman allows the treasures of the landscape to dictate the flow of play. Craggy rock outcroppings, twisted knots of scrub oak, rugged gulches and wildflower meadows combined with plenty of elevation changes and dramatic vistas of the mountains make for a unique golf experience. There’s plenty of room off the tees, but Norman plastered the layout with bunkers. There’s just enough water, like the stream guarding the 18th green, to make it interesting. Closely mown areas around the green means bump and run shots or a putter may be your best option. The course can be stretched to 7,580 yards, but remember this is golf at a higher elevation (7,880 feet) where the ball travels farther. The Gold tees at 6,572 were just about right for my foursome. In fact, I came within inches of a hole-in-one on the 125-yard 10th hole where the pin was hidden from view from us on the tee. The Fazio course is shorter at 7,113 from the tips. Fazio’s design merges dramatic vistas of Vail’s Back Bowls with a variety of terrain, winding through open sage-covered hills and a dense aspen forest. Golfers staying at Rock Resorts properties have access to both courses on a rotating basis. Expect to pay $200. We stayed at the posh Arrabelle at Vail Square where there were free summer musical festivals going on both nights we were there. And, of course, we all had to take a spa treatment after a morning round of golf at the Vail Golf Club. This course is open to the public, located right next to busy I-70, and is fairly flat, making walking a definite option, especially with the next tees close to the last greens. In fact, we saw golfers riding bikes with clubs attached. It was the first course in Colorado to offer these bikes. The Vail G.C. can only be stretched to 6,766 yards and is player-friendly from the blues at 6,281 if you avoid the trees that line most of the fairways and stay out of Gore Creek, which cuts through the course. Plans call for a new clubhouse to be added next year, forcing the 18th green to be moved toward the tee, shortening what now is still a par 5. There are other public courses in the Vail Valley designed by the game’s top architects for those who decide for longer visits, including the Pete Dye-designed Gypsum Creek, the Arnold Palmer-designed Eagle Ranch, the Robert Trent Jones Jr.-designed Beaver Creek and the Bruce Devlin, Robert von Hagge-designed Eagle Vail. In addition, The Club at Cordillera (private) offers three courses, the Summit (Jack Nicklaus), the Mountain (Hale Irwin), the Valley (Tom Fazio) and a par-3 while The Sonnenalp (semi-private) has an 18-hole design by Bob Cupp and Jay Morrish.